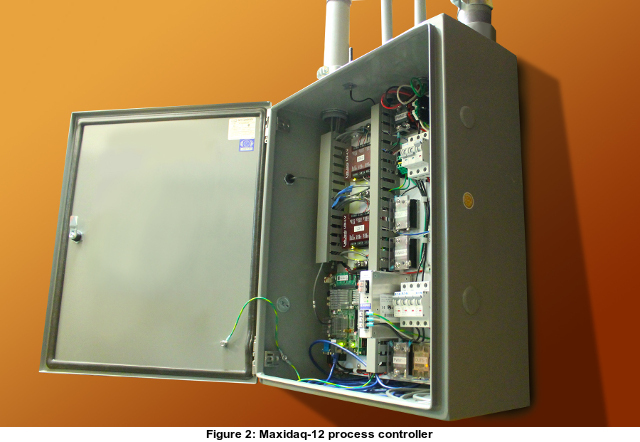 The Maxidaq is a process controller. It in enclosed in a watertight (NEMA 4) housing. Inside the Maxidaq is a CPU, data acquisition modules, solid state relays, and circuit breakers. 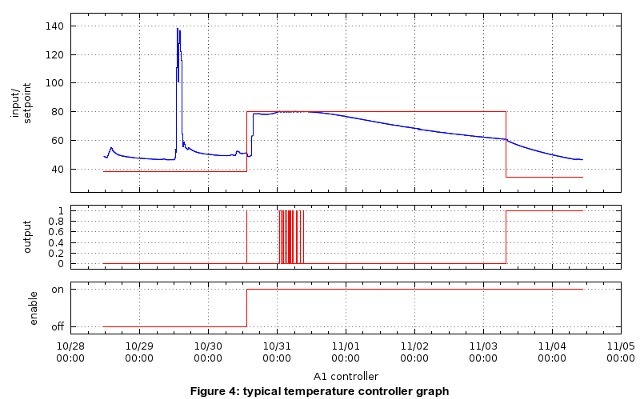 The data acquisition modules read data from sensors such as temperature probes. The solid state relays control outputs such as motors, heaters, or solenoid valves. In addition to connecting to sensors and actuators, the Maxidaq also comes with a WiFi hot spot and Ethernet port. The WiFi hot spot is used to connect directly to the Maxidaq. 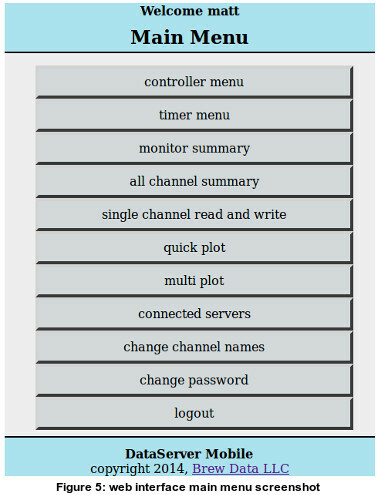 Ethernet is used to connect to the remote data archive server. The Maxidaq is designed for reliability. The watertight enclosure keeps out water and dust. There are no moving parts inside such as mechanical relays, hard drives, or fans. Multiple circuit breakers mean that even in a fault situation, other parts of the system can still function. 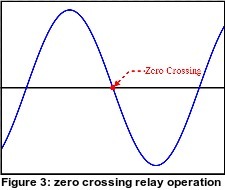 The solid state relays utilize zero-crossing technology to increase reliability and reduce electrical interference. The data archive server is where the data from the Maxidaq is stored. The data archive server also processes this data and provides data visualization, mostly in the form of graphs. This data can be used to diagnose system problems or to improve operations. It can also be used to prove regulatory compliance. The data archive server also provides a web site where users can remotely access their Maxidaq system. The data archive service can be thought of as a cloud based service. Security, privacy, and reliability have been design goals from day one. All data between the user and the data archive server is encrypted. All data between the Maxidaq and the archive server is encrypted using even stronger techniques. Safeguards are in place so that users can only see their data. Also the data is regularly backed up. The web based user interface provides the user with a means to control their Maxidaq and to access their data. Unlike a temperature controller or most traditional control systems, this user interface can be accessed from anywhere with Internet access. You don't need to stand in front of the control box to see what's going on. The Maxidaq can be mounted just about anywhere, ideally in a location that's easy to wire and install. The website is optimized for tablets and smart phones, but it also works on desktop or laptop computers, too. It works with Linux, Windows, Mac, IOS, and Android. The following is a screen shot of the main menu of the web based interface. One of the most expensive components of a control system is what's called the HMI (Human Machine Interface). The HMI consists of the buttons and display that one stands in front of to interface with the system. A touch screen display is a typical HMI. Watertight requirements drive the HMI cost even further. 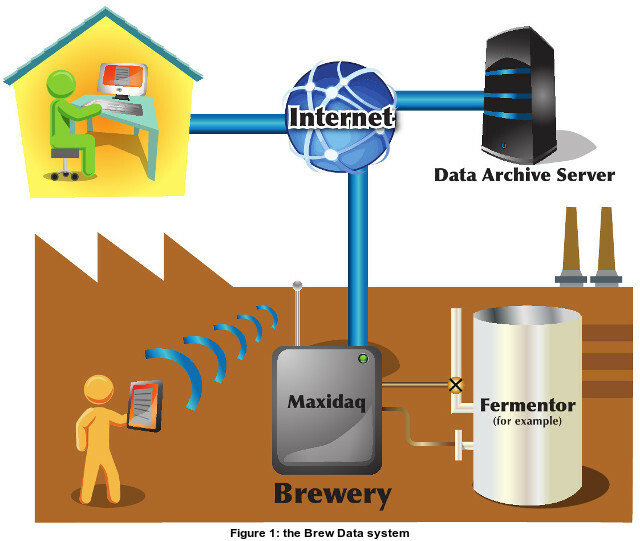 By using a web based interface, the Brew Data system eliminates the cost of the HMI. Another major cost driver is the software required to make the system work. This is especially true of PLC (Programmable Logic Controller) based systems. PLC hardware is relatively inexpensive, but hiring a software engineer to program a PLC can far outweigh the hardware costs. By using server side software, the Brew Data system leverages the cost of one software development effort across all installations.